Some people mistake me for a small Doberman because we look a great deal alike. My breed was developed to hunt vermin and to protect the home, and I do a great job at both. I do require quite a bit of exercise to stay healty and fit, but my short, sleek coat is not problem to take care of. I really enjoy being around people, so it is best to put me through obedience training at a very early age. That way we can all understand and abide by the rules together and I can be a pet for you to enjoy and be proud of. When fully grown, I am between 16 and 19 inches tall (40.6 to 48.3 centimeters) and I weigh between 25 and 35 pounds (11.3 to 15.8 kilograms). We have no German Pinscher Breeders listed at this time. 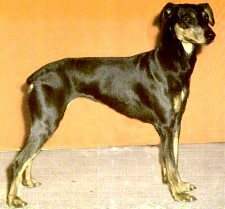 Click here to place your German Pinscher Ad!